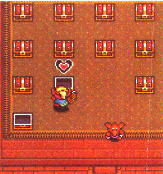 The table below shows the location of every piece of heart in a Link to the Past. 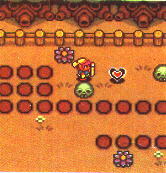 The only exception is the one you find inside the sanctuary, which is a full heart container that you can get anytime after rescuing Zelda the first time. Get this piece by cutting the bushes in this area and falling in the hole that appears. This one is in Kakariko village. Fall into the well and then bomb the wall inside to get the piece of heart. Enter Blind the Thief's hideout, and then bomb the wall downstairs. Complete the 15 second game in 15 seconds or less. Enter the Swamp Palace, and pull the switch on the right to drain the water outside. Then pick up the piece of heart from the water. Enter a cave towards the Northeast part of the Desert of Mystery. Bomb the wall at the bottom of the screen after talking to the old man. Dash into the pile of rocks just west of the Sanctuary. Exit the Desert Palace from the Western exit, and go down until you find the piece of heart. After buying the flippers from Zora, head south, and just after falling from the waterfall, go west until you reach this piece of heart. Fall off of Death Mountain near Specticle Rock onto this ledge. Inside the cave is a piece of heart. Go to Spectacle Rock in the Dark World, then use the Magic Mirror to warp back. 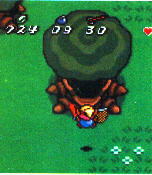 Do a dash attack on the tree the lumberjacks were cutting after defeating Agahnim. This is located on the East side of the Pyramid of Power. Stand here in Lake Hylia in the Dark World, and use the Magic Mirror. Go here (just south of the Haunted Grove in the Dark World) and use the Magic Mirror. If you play the digging game eventually you'll win a piece of heart. It's location is random, but if you play enough, you will eventually find it. Visit this ledge just north of the cemetary in the Dark World and use the Magic Mirror. Enter the cave where a sign outside reads "I'll give a piece of heart to the person who wears the cape." and use the cape and hookshot to reach a piece of heart. If you play the treasure chest game enough in the Village of Outcasts, you'll win a piece of heart eventually. Pound the 22 stakes south of the Blacksmith's house in the Dark World. Enter the western entrance in Misery Mire. Head to the far Northeast of Misery Mire and use the Magic Mirror to warp back to the Light World. Lift the stone nearby to enter a cave that contains a piece of heart. 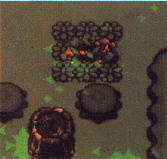 Enter this cave near Turtle Rock in Death Mountain. You will have to cross an invisible bridge after you enter, so use Ether magic to see where you're going. 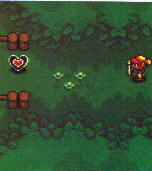 After exiting Turtle rock (about 1/2 way through the dungeon), stand here and use the Magic Mirror to warp to a cave that contains another piece of heart.